We love interviews in the library, cocktails in the bar, ice-cream sundaes by the pool, dinners on white tablecloths, lunch on the patio, games of croquet on the lawn and dinner parties with visiting filmmakers in the Breasted House. But nothing beats the feel of relaxed Western elegance we get within the pink walls. 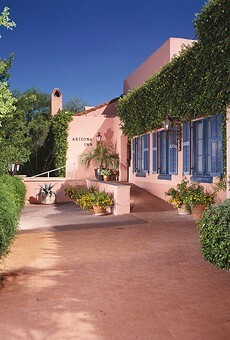 In an age when big hotel chains are trying to mimic the feel of boutique hotels, the Arizona Inn remains the real deal: As authentic as when it was first opened by Isabella Greenway in 1930 and thankfully still owned by her family, who remained dedicated to carrying on her legacy. Send your out-of-town friends here the next time they come to visit and they'll fall in love with this town, guaranteed.